1. In a medium bowl, whip together cream cheese, cilantro, garlic, salt and pepper. Place eggs in a small bowl. Place Italian-style seasoned breadcrumbs in a small bowl. 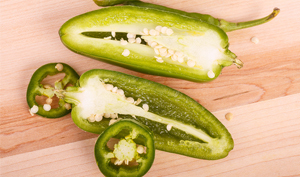 Wash jalapenos. Cut off tops to remove stems and remove seeds. Stuff each with equal amounts of the cream cheese mixture. Roll in the eggs, then coat with breadcrumbs. 2. Heat oil to 378° F. In batches, deep fry stuffed, coated jalapenos in preheated oil for 5 minutes, or until golden brown. Drain on paper towels.